There is only one function for creating a new TextView widget. A TextView widget doesn't have scrollbars to adjust the view in case the text is larger than the window. To provide scrollbars, you add the TextView to a ScrolledWindow (see Section 10.9, “Scrolled Windows”). The setting argument is a TRUE or FALSE value that specifies whether the user is permitted to edit the contents of the TextView widget. The editable mode of the TextView can be overridden in text ranges within the TextBuffer by TextTags. The justification will be JUSTIFY_LEFT if the wrap_mode is WRAP_NONE. Tags in the associated TextBuffer may override the default justification. left_margin, right_margin, indent, pixels_above_lines, pixels_below_lines and pixels_inside_wrap are specified in pixels. These default values may be overridden by tags in the associated TextBuffer. tabs is a pango.TabArray. 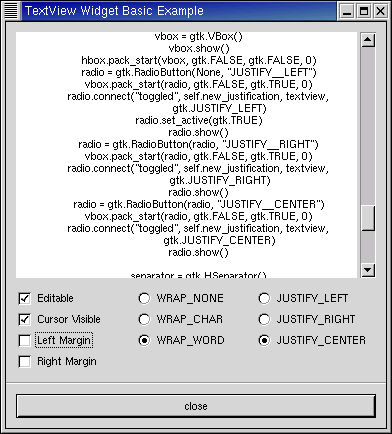 Lines 10-34 define the callbacks for the radio and check buttons used to change the default attributes of the TextView. Lines 55-63 create a ScrolledWindow to contain the TextView. The ScrolledWindow is packed into a VBox with the check and radio buttons created in lines 72-140. The TextBuffer associated with the TextView is loaded with the contents of the source file in lines 64-70.